Everyone has heard of SnapChat. It’s the fun app that lets you send temporary images to your friends and others. In fact, it go so popular that it was subject to a $3bn takeover bid from Facebook. > You can “Sling” your image or video to one friend or multiple friends at once. > Your friends have to “Sling” something back to you before they can see yours. > If they don’t want to send anything back, they can simply swipe your “Sling” away. 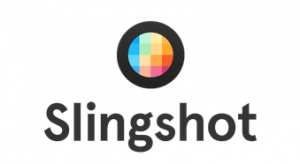 In an app clearly designed to improve connections between users, Slingshot’s blog post of the day said that every user already feels closer. Do you think this has the potential to be better? Or have Facebook made it worse by adding the “have to sling back” action?